Nystatin was discovered in 1950 by Rachel Fuller Brown and Elizabeth Lee Hazen. It was the first polyene macrolide antifungal. It is on the World Health Organization's List of Essential Medicines, the most effective and safe medicines needed in a health system. It is available as a generic medication. The wholesale price of the cream in the developing world is about US$0.70 per 30 gram tube. In the United States a course of treatment costs less than US$25. It is made from the bacterium Streptomyces noursei. In 2016 it was the 217th most prescribed medication in the United States with more than 2 million prescriptions. Skin, vaginal, mouth, and esophageal Candida infections usually respond well to treatment with nystatin. Infections of nails or hyperkeratinized skin do not respond well. It is available in many forms. When given parenterally, its activity is reduced due to presence of plasma. Oral nystatin is often used as a preventive treatment in people who are at risk for fungal infections, such as AIDS patients with a low CD4+ count and people receiving chemotherapy. It has been investigated for use in patients after liver transplantation, but fluconazole was found to be much more effective for preventing colonization, invasive infection, and death. It is effective in treating oral candidasis in elderly people who wear dentures. It is also used in very low birth-weight (less than 1500 g or 3 lb 5oz o) infants to prevent invasive fungal infections, although fluconazole is the preferred treatment. It has been found to reduce the rate of invasive fungal infections and also reduce deaths when used in these babies. Liposomal nystatin is not commercially available, but investigational use has shown greater in vitro activity than colloidal formulations of amphotericin B, and demonstrated effectiveness against some amphotericin B-resistant forms of fungi. It offers an intriguing possibility for difficult-to-treat systemic infections, such as invasive aspergillosis, or infections that demonstrate resistance to amphotericin B. Cryptococcus is also sensitive to nystatin. Additionally, liposomal nystatin appears to cause fewer cases of and less severe nephrotoxicity than observed with amphotericin B. In the UK, its license for treating neonatal oral thrush is restricted to those over the age of one month. It is prescribed in 'units', with doses varying from 100,000 units (for oral infections) to 1 million (for intestinal ones). As it is not absorbed from the gut, it is fairly safe for oral use and does not have problems of drug interactions. On occasion, serum levels of the drug can be identified from oral, vaginal, or cutaneous administration, and lead to toxicity. Bitter taste and nausea are more common than most other adverse effects. 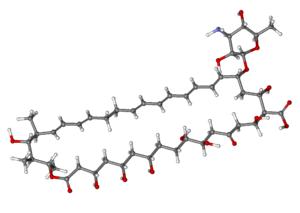 Like amphotericin B and natamycin, nystatin is an ionophore. It binds to ergosterol, a major component of the fungal cell membrane. When present in sufficient concentrations, it forms pores in the membrane that lead to K+ leakage, acidification, and death of the fungus. Ergosterol is a sterol unique to fungi, so the drug does not have such catastrophic effects on animals or plants. However, many of the systemic/toxic effects of nystatin in humans are attributable to its binding to mammalian sterols, namely cholesterol. This is the effect that accounts for the nephrotoxicity observed when high serum levels of nystatin are achieved. Nystatin A1 (or referred to as nystatin) is biosynthesized by a bacterial strain, Streptomyces noursei. The structure of this active compound is characterized as a polyene macrolide with a deoxysugar D-mycosamine, an aminoglycoside. The genomic sequence of nystatin reveals the presence of the polyketide loading module (nysA), six polyketide syntheses modules (nysB, nysC, nysI, nysJ, and nysK) and two thioesterase modules (nysK and nysE). It is evident that the biosynthesis of the macrolide functionality follows the polyketide synthase I pathway. The melting point of nystatin is 44 - 46 °C. Like many other antifungals and antibiotics, nystatin is of bacterial origin. It was isolated from Streptomyces noursei in 1950 by Elizabeth Lee Hazen and Rachel Fuller Brown, who were doing research for the Division of Laboratories and Research of the New York State Department of Health. Hazen found a promising micro-organism in the soil of a friend's dairy farm. She named it Streptomyces noursei, after Jessie Nourse, the wife of the farm's owner. Hazen and Brown named nystatin after the New York State Health Department in 1954. The two discoverers patented the drug, and then donated the $13 million in profits to a foundation to fund similar research. Nystatin pastilles have been shown to be more effective in treating oral candidasis than nystatin suspensions. ^ a b c d e f g h i j k "Nystatin". American Society of Health-System Pharmacists. Archived from the original on 2016-02-03. Retrieved 2016-01-27. ^ a b Espinel-Ingroff, Ana Victoria (2013). Medical Mycology in the United States a Historical Analysis (1894-1996). Dordrecht: Springer Netherlands. p. 62. ISBN 9789401703116. Archived from the original on 2016-02-02. ^ Gupte, M.; Kulkarni, P.; Ganguli, B. N. (January 2002). "Antifungal Antibiotics". Appl Microbiol Biotechnol. 58 (1): 46–57. doi:10.1007/s002530100822. PMID 11831475. ^ "Nystatin". International Drug Price Indicator Guide. Retrieved 2016-01-27. ^ a b Hilal-Dandan, Randa; Knollmann, Bjorn; Brunton, Laurence (2017-12-05). Goodman & Gilman's the pharmacological basis of therapeutics. Brunton, Laurence L.,, Knollmann, Björn C.,, Hilal-Dandan, Randa (Thirteenth ed.). [New York]. ISBN 9781259584732. OCLC 994570810. ^ D., SATOSKAR, R. S.. REGE, NIRMALA N.. BHANDARKAR, S. (2015). PHARMACOLOGY AND PHARMACOTHERAPEUTICS. [S.l. ]: ELSEVIER INDIA. ISBN 978-8131243619. OCLC 978526697. ^ Gøtzsche PC, Johansen HK (September 2014). "Nystatin prophylaxis and treatment in severely immunodepressed patients". The Cochrane Database of Systematic Reviews (9): CD002033. doi:10.1002/14651858.CD002033.pub2. PMID 25188770. ^ a b Lyu, Xin; Zhao, Chen; Yan, Zhi-Min; Hua, Hong (2016). "Efficacy of nystatin for the treatment of oral candidiasis: a systematic review and meta-analysis". Drug Design, Development and Therapy. 10: 1161–1171. ^ Pappas, PG; Kauffman CA; Andes D; et al. (2009). "Clinical practice guidelines for the management of candidiasis: 2009 update by the Infectious Diseases Society of America". Clin Infect Dis. 48 (5): 503–35. doi:10.1086/596757. PMID 19191635. Archived from the original on 2014-10-21. ^ "Micromedex Detailed Drug Information". Archived from the original on 2013-12-21. Retrieved Apr 1, 2014. ^ "FDA approved package insert" (PDF). Archived (PDF) from the original on 2014-04-21. ^ Rosenberger A, Tebbe B, Treudler R, Orfanos CE (June 1998). "[Acute generalized exanthematous pustulosis, induced by nystatin]". Der Hautarzt; Zeitschrift Fur Dermatologie, Venerologie, und Verwandte Gebiete (in German). 49 (6): 492–5. doi:10.1007/s001050050776. PMID 9675578. ^ P., Rang, H. (2015-01-21). Rang and Dale's pharmacology. Dale, M. Maureen,, Flower, R. J. (Rod J. ), 1945-, Henderson, G. (Graeme) (Eighth ed.). [United Kingdom]. ISBN 9780702053627. OCLC 903083639. ^ Hammond, S.M. (1977). Biological activity of polyene antibiotics. Progress in Medicinal Chemistry. 14. pp. 105–79. doi:10.1016/S0079-6468(08)70148-6. ISBN 9780720406450. PMID 345355. ^ Dewick, Paul M. (2009). Medicinal Natural Products: A Biosynthetic Approach (3rd ed.). UK: John Wiley & Sons Ltd. ISBN 978-0-471-97478-9. ^ Elsner, Zofia; Leszczynska-Bakal, Halina; Pawlak, Elzbieta; Smazynski, Teofil (1976). "Gel with nystatin for treatment of lung mycosis". Polish Journal of Pharmacology and Pharmacy. 28: 49–52. ^ Kelly, K. (2010). Medicine Becomes a Science: 1840-1999. p. 71. ISBN 978-1-4381-2752-1. Archived from the original on 2017-03-23. ^ Sicherman, B.; Green, C.H. (1980). Notable American Women: The Modern Period : a Biographical Dictionary. Belknap Press of Harvard University Press. p. 327. ISBN 978-0-674-62733-8. Archived from the original on 2017-03-23. ^ Akaike N, Harata N (1994). "Nystatin perforated patch recording and its applications to analyses of intracellular mechanisms". The Japanese Journal of Physiology. 44 (5): 433–73. doi:10.2170/jjphysiol.44.433. PMID 7534361. ^ "Drugs & Medications". www.webmd.com. Retrieved 2018-11-11.